Compilation comics can be bit like Saturday morning kids’ magazine shows. You know, when they’d chop up a 20 minute episode of something into 4 bits, and you’d always miss the crucial one because you accidentally fed Yoda to the Rancor? So new entry points are always good. Some might rankle at this being 2000AD’s third in the space of six months, but I rather think that it’s a formula that’s really working for them. And if like me you’ve missed the last 3 issues (which with a weekly format is always a risk), it’s a great way to get back in. So, anyway, let’s break down the individual stories in this prog. Dredd has many big, overarching storylines. Titan, the Judge prison, stretches all the way back in the Megaverse and so stories that deal with it usually have a weight of cannon to reconcile. Effectively, however, this is clean slate – building a new prison, the old one having been destroyed. The narrative is teasingly good, asking some pretty fundamental questions about justice from the outset, and the bizarre perp is spot on for Dredd’s crazy world. The art is evocative, and the colours are particularly strong, with eye-stretching contrasts that really help the piece to pop. Looks like a great addition to the narrative. Dredd may have big storylines, but we are mostly familiar with basic premise. Slaine, on the other hand, had a dense ancient mythology that really takes a lot of getting your head round. That being said, the synopsis does get you up to speed relatively quickly: our Irish warlord is off to rescue a girl who has been captured by a dark priesthood – although naturally, nothing’s ever that simple. Pat Mills continues to show his diverse talents as a writer, though this does feel like a bit of a slow burner – but then, this is clearly the setup for something more. The art is staggering here, glorious, visceral brush strokes from Davis that feel tangible and terrifying; for me, the highlight of the issue. Abnett’s a bit of divisive figure; many people love his grimdark sci-fi, others sigh and move on. Whilst I’m somewhere between the two, I’m not sold on this story of an alien ghetto in middle America and those who police it. I think there’s a missed opportunity here on several levels – a completely new story for readers old and new would’ve been a good idea, and this, whilst not a long-established part of the Galaxy’s Greatest Comic, still feels like it’s partway through a narrative. I’m not crazy about the art, either; I somehow expected something more alien, frankly, from the aliens. Probably the only weak point in the prog; not bad, just not very good. Another character from the depths of Dredd, exploring the back story of East-Meg’s greatest assassin allows writers to put a fresh spin on old ideas. 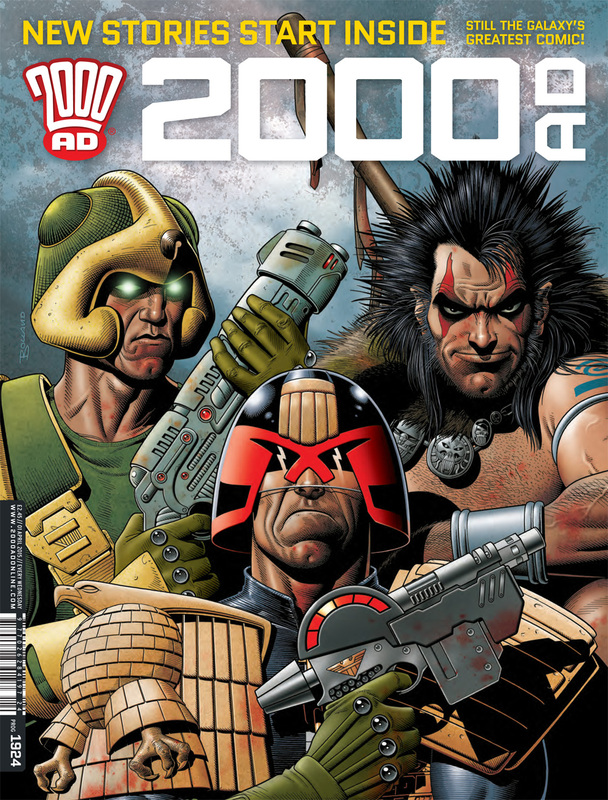 This issue has wry humour, punch, stylish 80s Dredd line art (black and white, no less, in an otherwise full-colour comic) and social commentary – it’s the very essence of what Dredd, and by extension 2000 AD, should be. It’s great to see new writer/artist teams create something really substantial in Tharg’s sandbox. That being said, it’s completely accessible to new readers also, and has a great time in the process. Lastly, they bring out the big guns, the dream team. Johnny Alpha, mutant Bounty Hunter, with the big man writing and Ezquerra in full-colour glory. Although you have to plough through a lot of synopsis to get up to speed, it’s well worth it: this is almost effortlessly brilliant, and reminds of how Wagner’s writing in particular drove 2000 AD to success, with maximum thrill-power. For leading a rebellion against the humans, Johnny’s in jail, but now has a chance to save himself and his fellow Dogs – but at what price? I won’t give too much away on this, but ends the prog on one heck of a high note. Overall, it’s really about time you read 2000AD if you haven’t already, go back to it if you’re lapsed, and feel smug if you’re still going. You’re bound to find something you like, and a new favourite story in the process. Zarjaz!